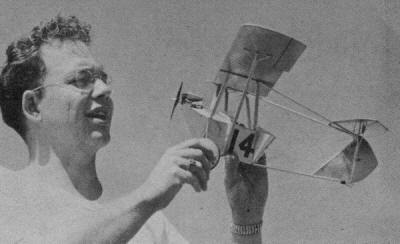 Here is a simple but challenging little free flight model of a vintage lightplane racer. Designed and flown in the early 1920s by Mr. Ettienne Dormoy, this "Bathtub" airframe resembles some of today's ultralights. Walt Mooney's version used a Cox .010 engine, but a brushless motor and LiPo batteries can easily be substituted, and a micro size radio system can even be accommodated. The plans do not seem to be available for purchase, so I posted the full-resolution scan for use (click on the image for the large version). Modeler & Full Size Plane Designer Walt Mooney Recreates for You - Dormoy's Famous "Bathtub"
Author Mooney with "Bathtub" lightplane racer. 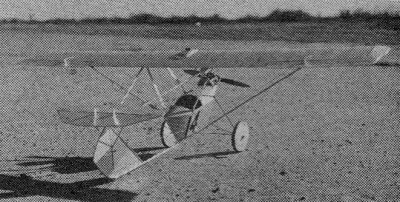 In 1923 Ettienne Dormoy, then working for the Army Air Force at what is now Wright field, designed and built this little ultra-light for the 1924 Lightplane air races. 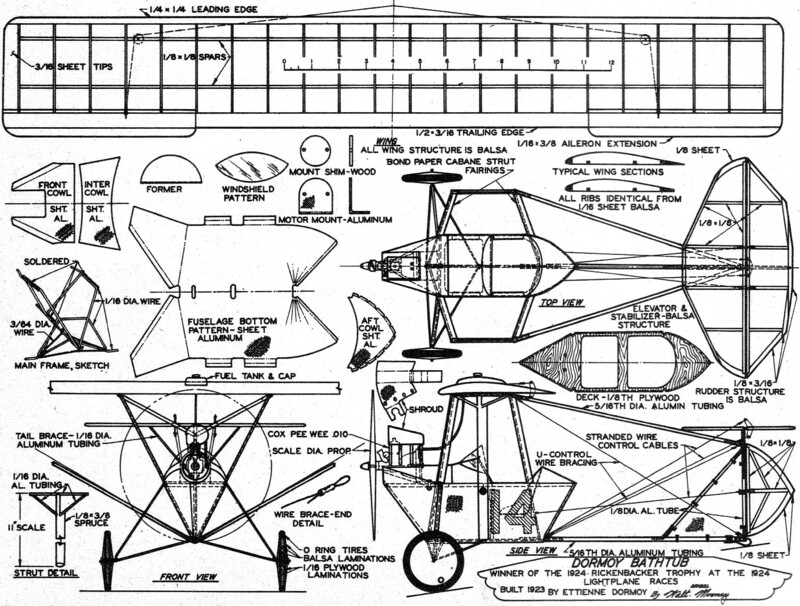 Its novel engineering has intrigued the aviation world ever since. We became acquainted with the late Mr. Dormoy during the last few years he was an engineer for Convair, San Diego. A good deal of research has gone into this model. We believe that the plans are as near scale as is possible. Unhappily, Mr. Dormoy had not carefully saved three views for the modeling posterity. He did have some photos and did compare my attempts at an earlier three view. 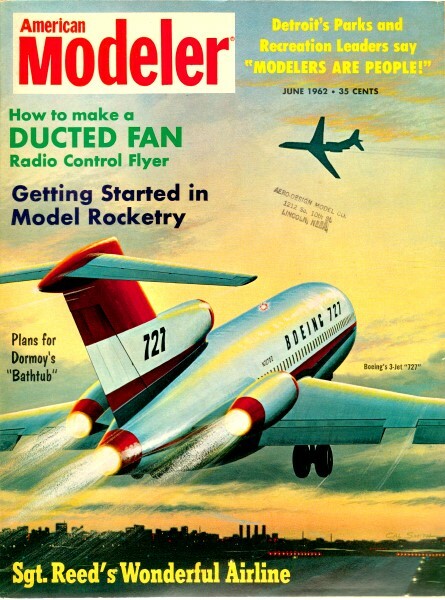 The Douglas Rolfe's three view of the Bathtub appeared in the Spring 1960 Air Progress. The Bathtub won or placed in the first three races it entered as follows: (1) First race, first place, one plane finished; (2) Second race, second place, two planes finished; (3) Third race, third place, three planes finished. The other racers were overheating. This problem was solved on the Bathtub by the shroud which ducted cooling air over the cylinders of the Henderson four cylinder motorcycle engine. This device was copied by first one and then two of its competitors! The Bathtub won the cross-country race between Dayton and Cincinnati and the Rickenbacker trophy. Since the fuel supply in the single wing tank was not enough to permit a non-stop hop Dormoy carried a five gallon can on his lap during the flight and a wobble pump to transfer the gasoline to the gravity feeding tank on the wing. Unfortunately the pump broke on the first wobble and the pilot was forced to blow into the can using lung power to pressurize the can and, so to transfer the fuel. Mr. Dormoy earned the Rickenbacker trophy the hard way! When testing the plane for maximum speed, the Bathtub was dived above 100 miles per hour (max, level speed was about 70) and a vibration was noted. One of the upper tail booms was vibrating with a six inch amplitude that was increasing. Dormoy reached back as far as possible and stabilized the boom with his hand. On recounting this Mr. Dormoy said, "It's probably a good thing I didn't fly the plane too much." He also claimed to be one of the few race pilots ever to come out ahead financially. He sold the Bathtub after the races for what it it cost him ... and figured the prizes were all profit. Within practical limits the model has the same type of structure as the original. Fuselage and fin are aluminum sheet as was the prototype. Wing horizontal tail and rudder are built-up balsa structures with tissue covering. Tail booms are aluminum tubes. Main frame and landing gear is a soldered steel wire assembly. Fin and tail are held on with wire wrapping as on the original. I would recommend .004 thick aluminum lithograph sheet if you can get it. I used .012/2024/T83 sheet which is heavier than necessary. The little Cox .010 has plenty of power for my 6 1/2-oz. job so weight isn't critical but light airplanes don't get hurt so easily. For wing, horizontal tail and rudder cut all parts and assemble over plan. When dry, remove, carve leading and trailing edges to section shown and sandpaper well to prepare for covering. Main frame is eight pieces of wire bent to shape. This must be done accurately because alignment of the entire model depends on it. Make the cabane-keel assembly first. This is all the main frame except the landing gear wires. Keel sticks into bottom boom at rear end of body, has a quarter inch bent up to match front angle of body. Two cabanes are bent up. These are identical and form wing support braces from the fuselage. They start with a half inch length parallel to keel at forward end then run up, forward cabane strut, back to rear cabane strut, down to keel and forward three quarters of an inch. Two short lengths of wire run along upper section of cabane wire to connect with upper tail booms. These five wires are soldered together as shown in main frame sketch. Additional construction notes appear on the full size Hobby Helpers' plans. Walt Mooney Plans for Dormoy's Famous "Bathtub"
are available from Hobby Helpers.